Growing conditions were very favorable for corn production across most of Ohio in 2018. The growing season was characterized by well above average rainfall and heat unit accumulation (growing degree-days). Precipitation and heat unit accumulation were generally greater at OCPT sites in the SW/WC/C region (with rainfall ranging from 23.3 to 26.3 inches and heat unit accumulation ranging from 3270 to 3520 GDDs) than at sites in the NW and NC/NE regions. Moreover, rainfall was generally well distributed at these sites. The impact of dry conditions in July and August on crop performance at the Van Wert and Hoytville sites in NW Ohio and the Wooster and Beloit sites in NE/NC Ohio were mitigated by timely rains in late August and September. Due to the warm, wet conditions, foliar diseases (primarily gray leaf spot) and ear rots (primarily Gibberella and Diplodia ear rots) were present at nearly all test sites. However, the disease severity was highly variable and it was usually most pronounced for a limited number of hybrids. The highest yielding sites were generally associated with foliar fungicide applications at tassel – the major exception being the test site at Bucyrus (the second highest yielding OCPT site in 2018) which exhibited little leaf disease or ear rot. Stalk lodging was evident mostly in the NW and NE/NC test sites but negligible for most of the hybrids evaluated. Warm temperatures in August through mid-October promoted crop maturation and dry down but persistent rains in September through November slowed harvest. In 2018, USDA’s National Agricultural Statistics Service estimates Ohio’s corn yield at 193 bu/A, which would be 16 bu/A more than last year’s and highest on record if realized. Yields at OCPT test sites paralleled the record yields reported across the state this year. Averaged across hybrid entries in the early and full season tests, yields were 273 bu/A in the Southwestern/West Central/Central region, 238 bu/A in the Northwestern region, and 242 bu/A in the North Central/Northeastern region. Yields at individual test sites, averaged across hybrid entries in the early and full season tests, ranged from 203 bu/A at Beloit to 285 bu/A at Greenville. Performance data for Upper Sandusky in the NW region is not presented because excessive rainfall shortly after planting created variable field conditions that resulted in erratic stands, uneven growth and inconsistent yields. Tables 1 and 2 provide an overview of 2018 hybrid performance in the early maturity and full season hybrid trials by region. Averages for grain yield and other measures of agronomic performance are indicated for each region. In addition, the range in regional test site averages is shown in parentheses. Complete results are available online at: http://oardc.osu.edu/corntrials/. A bulletin containing the results, 2018 Ohio Corn Performance Test,is also published as an insert in Ohio’s Country Journal. As you review 2018 test results, it’s important to keep the following in mind. Confidence in test results increases with the number of years and the number of locations in which the hybrid was tested. Avoid selecting a hybrid based on data from a single test site, especially if the site was characterized by abnormal growing conditions. Look for consistency in a hybrid's performance across a range of environmental conditions. Consider the table providing a “Combined regional summary of hybrid performance” which indicates the performance of hybrids common to nine statewide test sites and the six tests in western Ohio. Differences in grain moisture percentages among hybrids at harvest can provide a basis for comparing hybrid maturity. Yield, % stalk lodging, grain moisture, and other comparisons should be made between hybrids of similar maturity to determine those best adapted to your farm. Table 1. 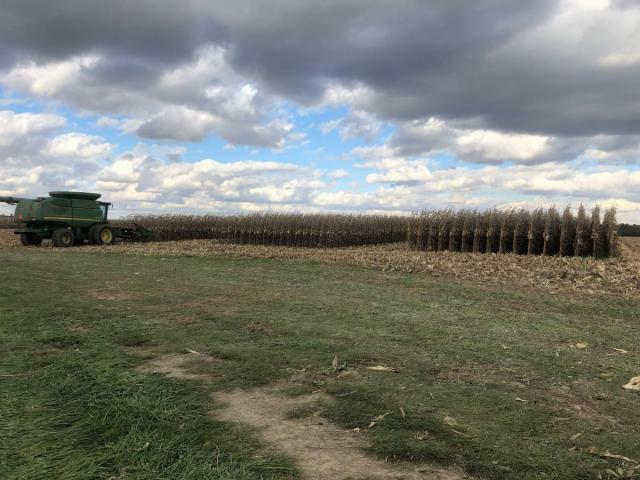 A regional overview of the early maturity 2018 Ohio Corn Performance Test. Table 2. A regional overview of the full season 2018 Ohio Corn Performance Test.